Felting, printing and crochet biscuits..
We’ve kicked off our new workshops with great fun and creativity at The Palace Hub. We had a fabulous fun group of attendees for our first day of workshops for both the lino printing and needle felting classes, lots of tea in vintage cups, and even some delicious home-made biscuits courtesy of Geraldine’s little daughter..
Our chaps created a kalaidoscopic range of beautiful designs, some using dual printing colours while others printed over tissue papers and on a range of backgrounds such as sugar papers and old book pages. We tried our hand at a ‘chine colle’ printing method, sandwiching glued papers between the inked lino and the base paper, to add vibrant colour to black mono-prints. Geraldine took the helm for the second class , where we had excellent wool-based fun with needle felting. We prodded and poked in great style and made some smashing little animals, brooches and floral inspired pieces. If you feel as though you’ve missed out , we’ll be doing it all again on Tuesday! More info here. 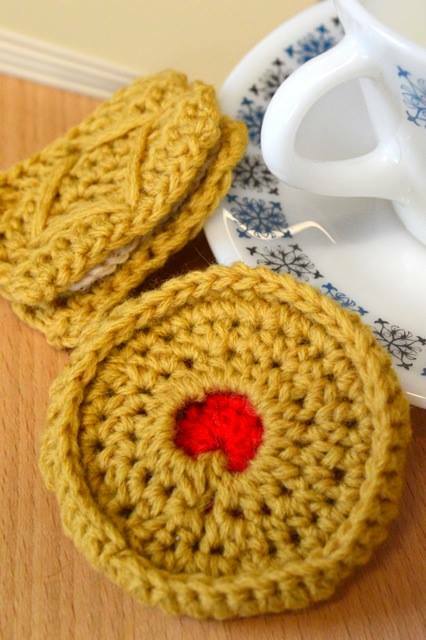 Meanwhile there are lots of markets and festivals to think about.. As I have been away visiting family I needed something portable, so have been making some fun little crochet biscuits to sell. Here you can see them by some fab little retro Pyrex cups given to me by lovely friend Abi of ‘Oh Abigail’. The pattern for the Jammy dodger is by Matt and can be found on his ‘According To Matt’ blog http://accordingtomatt.blogspot.co.uk/2011/07/jammy-dodger-pattern.html the custard cream is my pattern (which I will most certainly write down and share at some point) and I’m working on a bourbon too, so we’ll see how that turns out!